Motor Trails is a young travel organization that organizes motorbike-adventure trips to mostly distant destinations. To participate, you do not have to be a racer or a motor freak. The idea is a to see a lot, not too long distances a day and especially fully enjoy a beautifull motorcycle ride through a fantastic environment. All our tours are our own product, our own ideas, developed and organized by ourselves. Therefore, we do not sell tours of any other tour operators. With a few exceptions our own Dutch tourleaders will be coordinating the tour. Besides speaking Dutch all our tourleaders speak English, and , in many cases the local language. For some our short tours of about one week, we use local guides. In the tour details of every tour it is clearly indicated if we use a local guide or one of our own tourleaders. In 2000, the very first motorbike tour was carried out in Vietnam which immediately was a great success. This tour was carried out in collaboration with the travel agent "Koning Aap Reizen”. It was one-month long trip using two-stroke Russian motorbikes along the mountain tribes of northern Vietnam. Because of the enthusiasm of the participants, it was decided to continue and organize new tours. Our second destination was Cambodia. Since 2002, Motor Trails has been operating entirely independent. Meanwhile we have developed a wonderful package of adventure motor trips around the world. The purpose of each of our Adventure and Culture tour is to see and experience the country, mostly off the beaten track, using the most suitable vehicle: the motorbike. Using the motorbike we can reach areas which cannot be visited otherwise and, at the same time, experience the ultimate personal freedom. 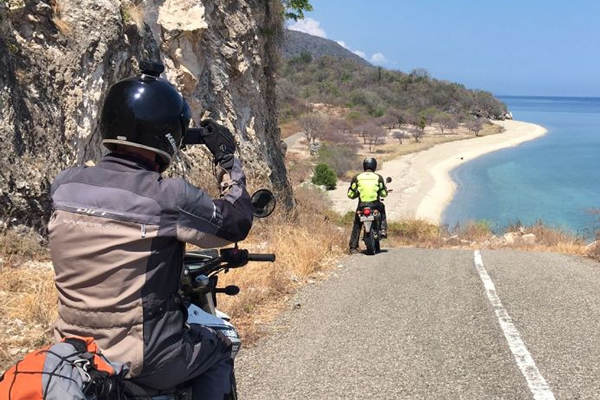 Due to the very good knowledge and experience we have in the different countries, we can show you the most beautiful parts that these countries have to offer with the enjoyment of riding a motorbike. Sometimes over asphalt, sometimes over stones, sand or mud. But always through a fantastic environment. Different factors play a part in determining the level of difficulty of the tour. It might be the altitude, the climate, or the distances. But in most of the cases it is largely determined by the amount of dirt roads. We do not aim to drive as much off road as possible. However, we are not going to leave them out, as it is a big part of the adventure. It also brings you to places that you will never be able to visit otherwise. We try to find the best balance between sealed roads and dirt roads, also taking into account what type of dirt road it is. We want to keep the tours accessible to all bike riders, so off-road experience is not required on most trips. It is not important how fast or how good you are, as the daily riding distances are well within reach of everyone. In the details of each tour you will find how many dirt roads you can expect. For some trips, some off road experience is recommended. 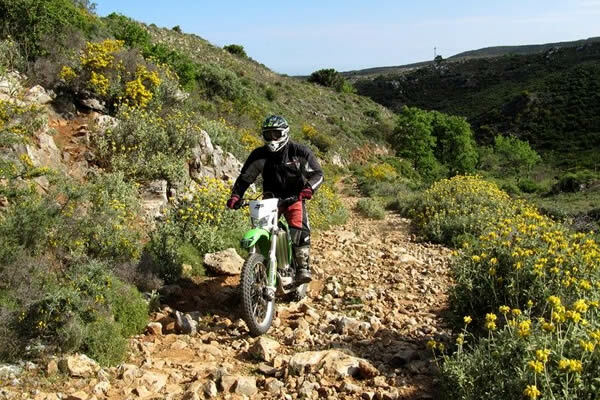 For example, you can participate in our basic off-road training. The itinerary is in principle predefined. The hotels are booked in advance and the route is explored by us. We try to take a day off every four days. During these days there is always something to do or see, like a day trip, a market, a walk or a boat trip. It's also possible that new routes are suddenly available or that the adventurous road is suddenly asphalted. So the tour leader will once again check new routes. These days will of course be extra adventurous. To keep maximum flexibility, we travel in small groups. A small group has also its advantage when traveling through remote areas where the limited accommodation is not always tailored to tourists. The minimum number of motorcycle participants is 8 and the maximum is limited to 12. For off-road trail tours, the minimum is 6 and the maximum 8. A duo passenger travels during the tour on the back of the motorbike. The number of duo passengers is limited to a maximum of two, because under extreme bad road conditions, the duo passengers should be able sit in the back-up car (see below). There are usually two places available in the back-up car; in some occasions only one. The back-up car is usually a 4x4 jeep. The back-up car always drives behind the group, no one is allowed to ride behind the car. The back-up car transports your luggage so that you have full freedom while driving, only carrying a small backpackfor your daily needs. There is always a place in the back-up car for the exceptional case that a bike rider cannot continue anymore. This can happen when, for example, the motorbike has a technical problem which cannot be solved on-the-spot. The motorbike will also be put inside the car, or on an imperial. The mechanic is someone from the country itself and belongs to the motorbike shop or, in some cases, is a personal contact from Motor Trails. He travels in the back-up car with a large bag of spare parts and tools and can carry out repairs to the engines on-the-spot. Every day after arriving at the hotel, he will check and maintain the bikes and repairs what was not possible to be repaired during the day. In some occasions he will go with the bike to a local repair shop if he cannot do the repairs himself. With a few exceptions a Dutch, English-speaking tour guide will accompany each tour. Motor Trails tour guides have earned their traces in the adventure tour or motorcycle world. They know the road, the routes, the hotels, the nicest places to stop and to eat and drink, and have a lot of experience in the country. But above all, they are one who are responsible that everything goes well during the tour. The tour guide ride their own motorbikes, and especially during the first couple of days they will ride in the front. In principle, the group will stay together, with the back-up car always in last position. This does not mean that you have to stick close to each other. The one drives faster than the other, and the other stops more often for photos. Usually the group spreads out, but comes together at certain times, and when going for a drink or lunch. In busy traffic situations, the tour leader will definitely drives in the front. On quiet days with little traffic, you have a lot more freedom. You can drive your own pace but with clear agreements where to stop. It usually means that you stop at junctions and at villages to bring the group back together. How this is organised depends on the destination and the tour guide. If you want to ride ahead of the group or want to stay somewhere longer you should consult the tour guide first. Individually driving a completely different route is not possible. The travel principle of Motor Trails is not only a lot of freedom when riding your bike. After arriving at a hotel you are free to go as you like. Go for a walk, explore the surroundings, eat a snack with local people, or play a game of billiards with the local youth. As long as you make sure that you are present at the agreed time of departure. In practice, the tour guide will always make sure there is something to eat or suggest a nice restaurant. If you have other plans, no problem. As we often go off the beaten track, there is usually little choice of hotels. This does not mean that all hotels are bad. With a few exceptions, all hotel rooms have their own toilet and bath with running water. When we have a choice, Motor Trails is always looking for a hotel with authentic atmosphere or with an added value through beautiful views or nice rooms. The tour prices are based on double rooms, so you share the room with another participant, of the same gender. If you prefer a single room there is an additional charge. The amount is different for each tour, and can be found under "pricing”. The motorbikes are rented locally. The brand and type are different for each destination, and subjected to the country's restrictions and rules. More information about the motorbikes you will find on the relevant tour on this site. The luggage will be transported by our back-up car. However, it is still advisable to keep them as light as possible. Ten kilos are very difficult to achieve but still a good directive. In addition to a big backpack, or duffel-bag, it is advisable to have a small backpack with you as well, for the items you need when you are on the road, such as a camera and a drinking bottle. Motor Trails tries to build as much variation as possible in the program. For example, most of the tours are organized with a number of excursions. This can be a trek, a boat trip, an elephant ride, wildlife safari. Everything depends on the country and the local possibilities. Excursions are already included in the schedule, are optional and are not included in the price. If you do not want to participate in one of the optionals, it is of course no problem and you do not pay for it. In many of our destinations traffic rules are not as strictly adhered to as you are used to, to put it mildly. Essentially, the basis rule is: the largest vehicle has the most rights. The main danger on the road is the crossing animals and other road users. Especially chickens and dogs try to reach the other side of the road at the very last moment. Also, local drivers do not get such a thorough driving training as we normally get. This can cause dangerous road situations. To play it as safe as we can, we try to avoid the major highways. The small roads are also much more fun to drive. And secondly, in the city of arrival, we will take time to practice and get used to the new traffic conditions. The routes we follow are chosen by their location and beautiful surroundings. However, to deviate from our planned route is not uncommon. New areas may just open or new roads have been created. We always try to visit areas that are not offered by any other travel organization. Also, motorbikes can come in places that are inaccessible to tourist buses or ordinary cars. Further, roads are not always reliable, and weather can ignore all forecasts, especially in mountainous areas. It may happen that it is not possible to follow the intended route and a search for an alternative route is required. Many times the road network in our destinations is not as extensive as we are used to and an alternative route may not be not around the corner. Therefore, alternative route can take only a few hours, but may also take a few days. In you like to book one of our Motor Trails tours, you must have a motorcycle license, some motor skills and a high degree of flexibility. But you definitely do not have to be a road racer or motor freak. Your flexibility may in some cases be even more important than your driving skills.